Lacecap or Mophead, I Can’t Make Up My Mind! There are many plants that seem almost mythical when you grow up in a very cold climate. Some plants are spices you want to grow like Ginger while others have fantastic forms or leaves like Caladiums and some have intense or unusual colors like sky blue flowers. 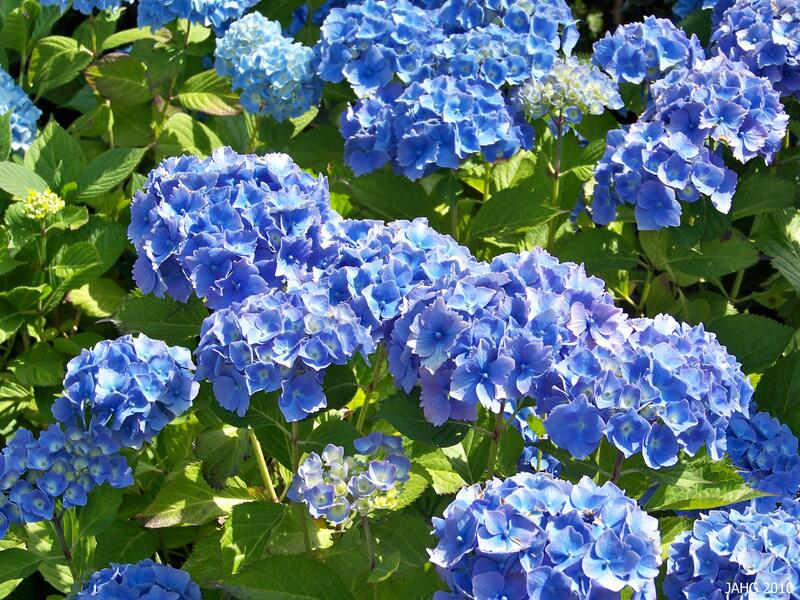 One plant which definately seemed to be a unreal to me were the big blue Bigleaf Hydrangeas (Hydrangea macrophylla) which I saw in florist shops or as dried flowers. Now I know they are real! Late June and throughout summer Hydrangea 'Endless Summer' colors many shrub and perennial borders here. Hydrangea macrophllya or Bigleaf Hydrangea orignates from Japan and was introduced to us by German naturalist Philipp Franz Balthasar von Siebold(1796-1866). he was the first European teach western style medicine in Japan from 1823-1829. He was able to after treating and healing in influential officer he was able to leave the isolated island near Nagasaki( Deshima) where outsiders were forced to live. While he was able to spend time off the island and started a medical school with 50 pupils and they helped him study the plants and animals which were only found in Japan which was his main interest there. During his short time in Japan he traveled to Edo(Tokyo) to collect specimens and later started a botanical garden behind his home with a greenhouse with over 1000 species of plants found in Japan. In Japan Hydrangeas have important cultural and artistic significance, especially around Kamakura. 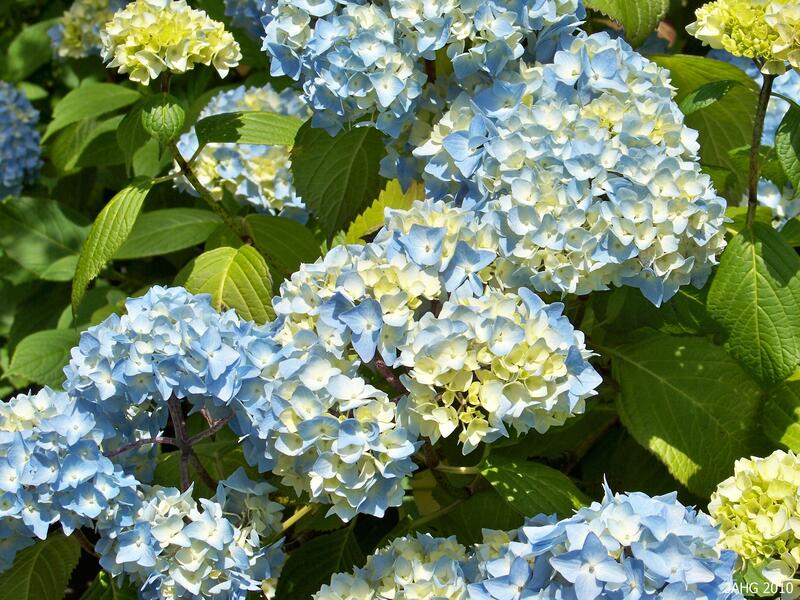 The Japanese believe that Bigleaf Hydrangeas was introduced into China from Japan. 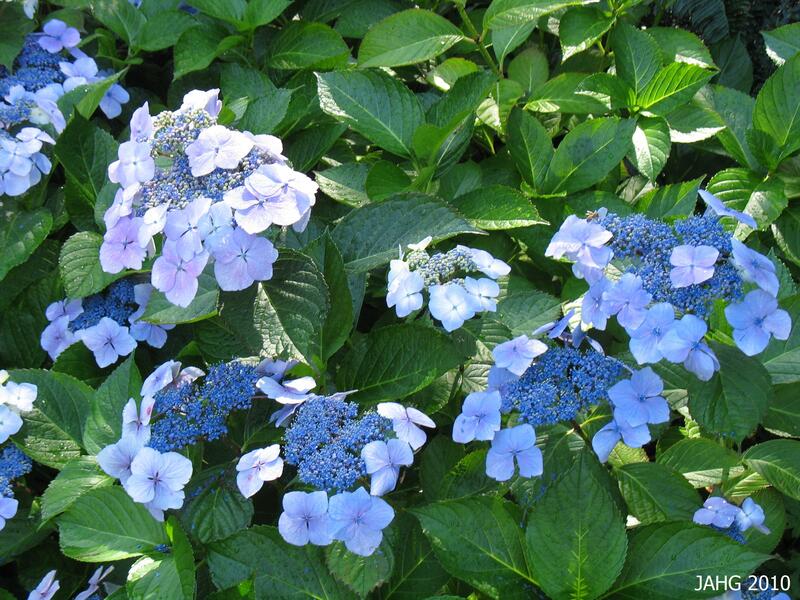 This may be true as Hydrangea macrophylla (f. normalis) is found growing on Honshu island in and around Tokyo and the island there. 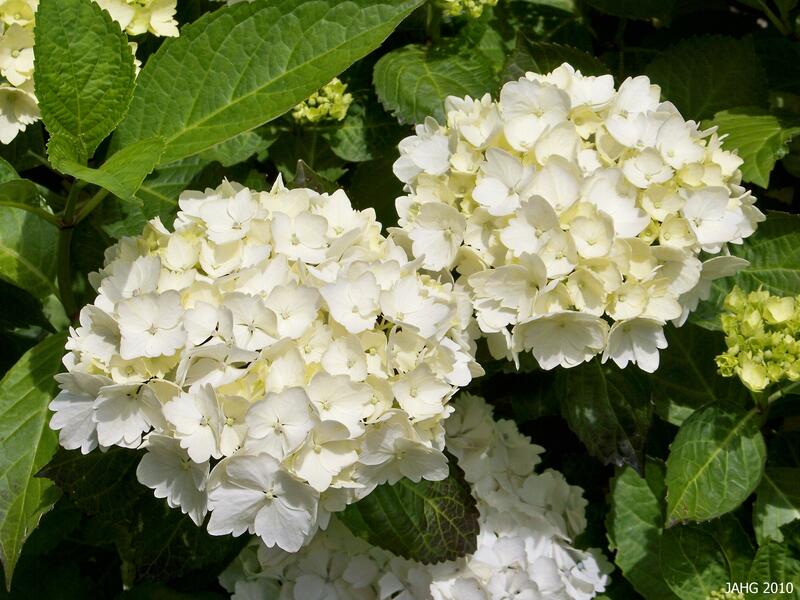 Hydrangea serrata is now held to be a form of macrophylla and also comes from mountainous areas of Japan and Korea. the Japanese have cultivated and breed flower colors and forms for hundreds of years. In Lacecap Hydrangeas the fertile flowers are the tiny center blossoms. Hydrangea macrophylla is interesting in that there is a great range of color from deep blue through almost red and many shades in between in the violets. shades also run to white. 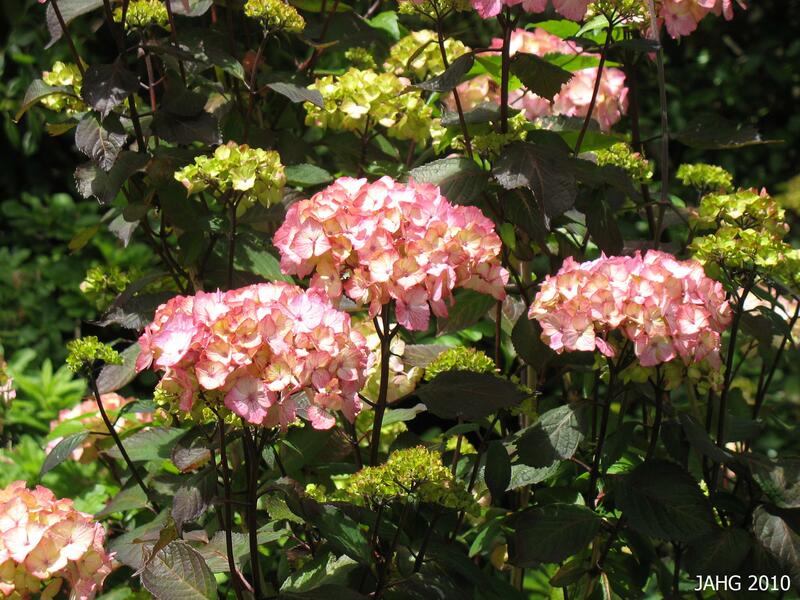 Color in Bigleaf Hydrangea can be very much influenced by the acidity of the soil. 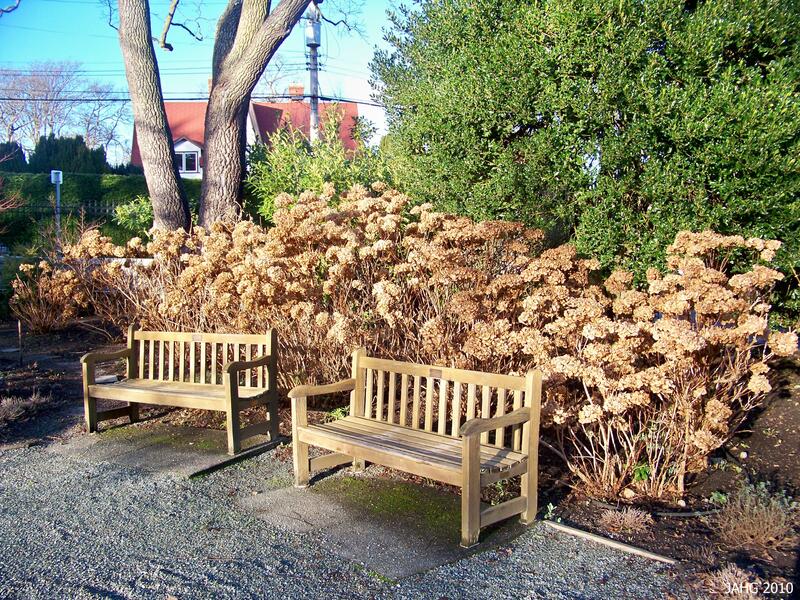 It is not unusual to see a recently planted shrub have slightly different coloring in the following years. If color is important to you first decide if you want pink or blue, if pink is wanted add a little dolomitic lime a few times a year to make the soil less acidic if you need to. For blue flowers you need to add aluminum sulfate at the rate of 14 ml or 1/2 oz (1 Tbsp) aluminum sulfate per gallon of water applied to the plant. the ph of the soil should be 5.2-5.5 constantly for a good blue. A cacophony of reds and violets in a Hydrangea macrophylla border planting at Government House In Victoria. Hydrangea macrophylla is very common here and there are many very old plants found in the older areas of this part of the island. They are remarkably adaptable plants which tolerant a range of conditions. Bigleaf Hydrangea tolerate complete shade to full sun but like it best when they get morning sun and protection from the afternoon heat. They need a rich moisture retaining soil which is nutrient rich to grow their best. They can grow in clays soil which are common here as along as they are not in a posistion of being kept too wet all the time, the more sun exposure and heat – the more water they will naturally need. This pure white Hydrangea macrophylla is probably "Blushing Bride' and is beautiful. A question often asked about Bigleaf Hydrangeas is how and when to prune. 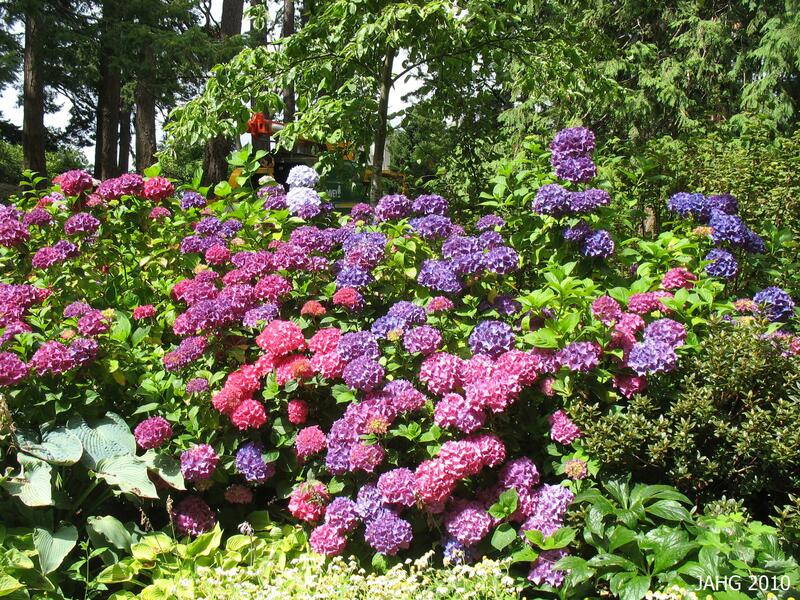 Hydrangeas need little pruning, removing spent flowers after blooming and shaping and thinning are both done soon after flowering as they set their flower buds for the next year soon after this. When pruning have a light touch and remove individual stems which are weak or congesting the plant, this way you will retain most of your flowers for the next year. the only time you might have to do major pruning is after a very cold winter where the tips have been damaged or killed. Here the slightly gaunt spent Hydrangea macrophylla flowers are left for winter interest in the gardens at Government House. Hydrangea macrophylla tolerate zone 8(-12c or 10f) which means mild winters such as here in the northwest of North America. They range in size between .6-2m (2 to 6ft) although I have seen some which are closer to 3m(9ft), care should be taken in finding one that fits in the space you have. Types which are listed(incorrectly) as ‘serrata’ species often are shorter in stature and are very well suited for our smaller urban gardens. The black coloring in this Hydrangea macrophylla. var.serrata 'Preziosa' adds some drama to the garden. The best place to see Hydrangea macrophylla cultivars is at Governement House, Walk the long borders and you will find sections in the shade and full sun. As you go to the back past the winter garden (leading to the Terraces) you will come to another section with violet and reds, these fade to the most interesting slate colors later with a touch of navy in them. Finnerty Gardens also have a good selection of species Hydrangeas which are found behind the chapel edging the grass area. Soon we will meet again here….I hope! I haven’t written about any large leaved plants other than Hostas yet, well this week is my chance to do that. These are not by any means the the largest but they will be classified a coarse in texture. Making space for one of these plants if you possibly is well worth. I first saw some of these plants working in a perennial nursery on the lower mainland and fell in love with them even though they looked really odd in one gallon pots. When i see Rodgersias, any species of them in a garden I am trilled by the beauty of their leaves. Bronze tinted Rodgersia aesculifolia emerges in the spring. 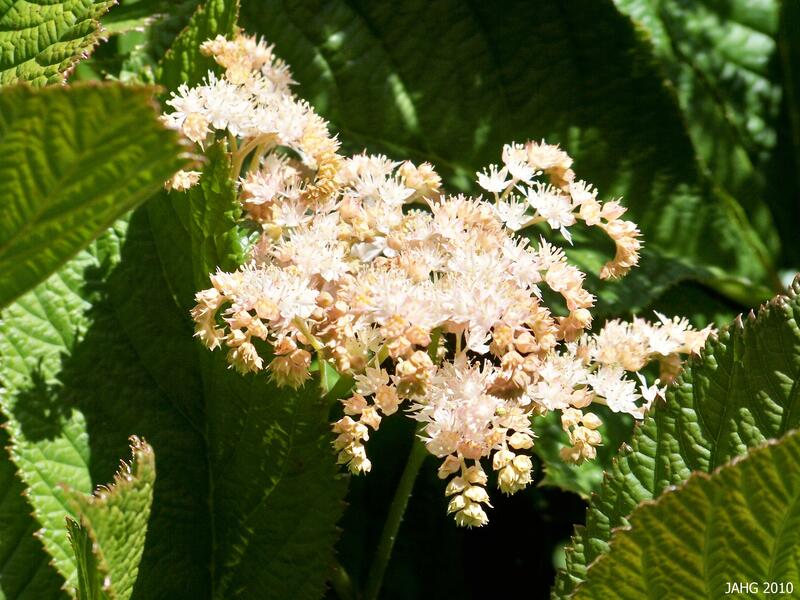 there are 5 species of Rodgersia which are known to us. The first to be found was Rodgersia podopyhlla. This plant was named by the famous Botanist Asa Gray (Gray’s Manual of Botany) in 1885. He chose to name the plant for Rear Admiral John Rodgers(1812-1882) who lead a pacific expedition(1852-1856) where this first species was found. 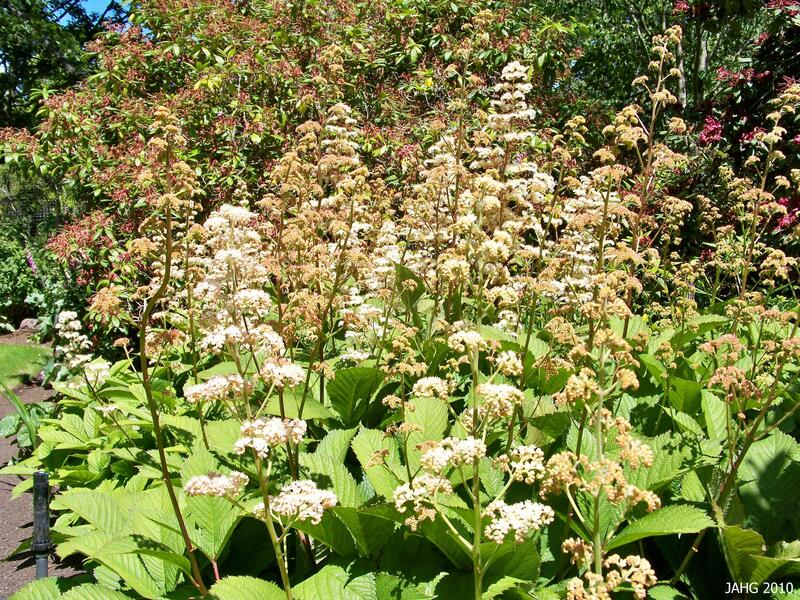 Rodgersia popdophylla is the only species which is found in Japan on the islands of Honshu and Hokkaido as well as in Korea. Rodgersia podophylla is the most commonly grown species seen in parks here in Victoria. The other 4 species of Rodgersia all come from Asia, ranging from most of China, south in to Myanmar through into Nepal. Rodgersia aescutifolia was found by Pere David in 1869 and he later discovered the species Rodgersia pinnata in 1883. Rodgersia sambucifolia was found by Ernest Wilson in 1904 while he was in Yalung, in western China. 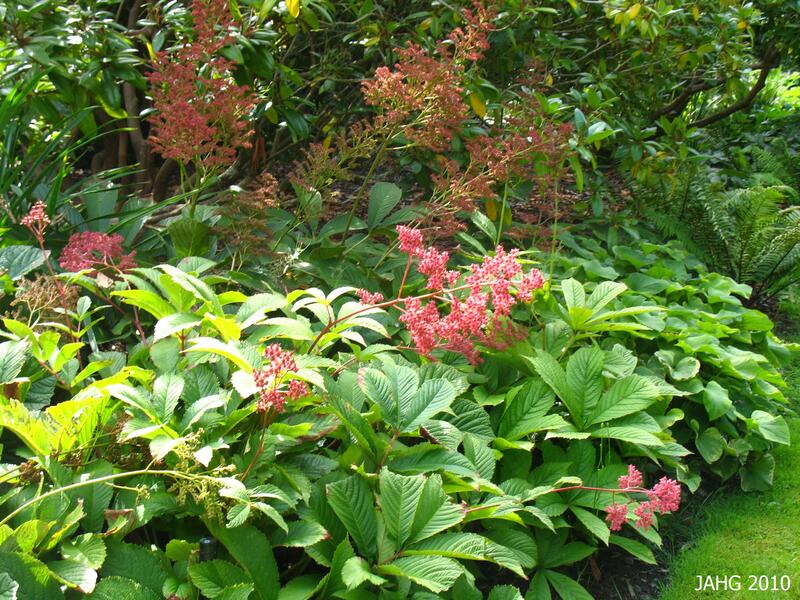 Rodgersia nepalensis is the most recent discovery which is still not commonly grown here. R. henrci is now considered a form of aescutifolia. The former species R. tabularis has been removed and given it’s own name Astilboides tabularis, it has large round leaves and slightly different looking flower scapes. Rodgersia pinnata and it's selected forms offer more of a range of flower color. The species of Rodgersia are known to interbreed which has created difficulty in horticulture in naming plants accurately, none the less these are all beautiful plants which add much to the look of a garden. There are also newer color forms with deeper brown and blackish tints. 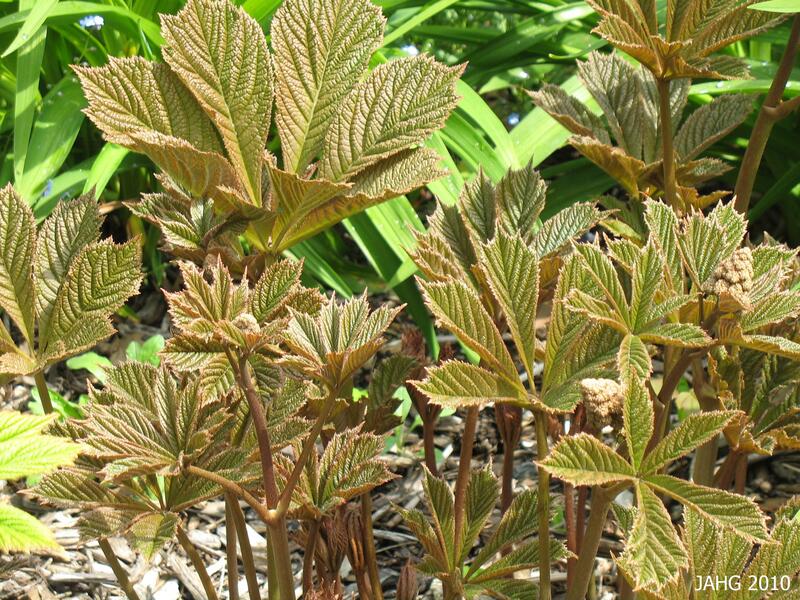 Rodgersia has the darkest leaves which often have tones of black and flowers sepals and stems which can be in dark maroon tones. 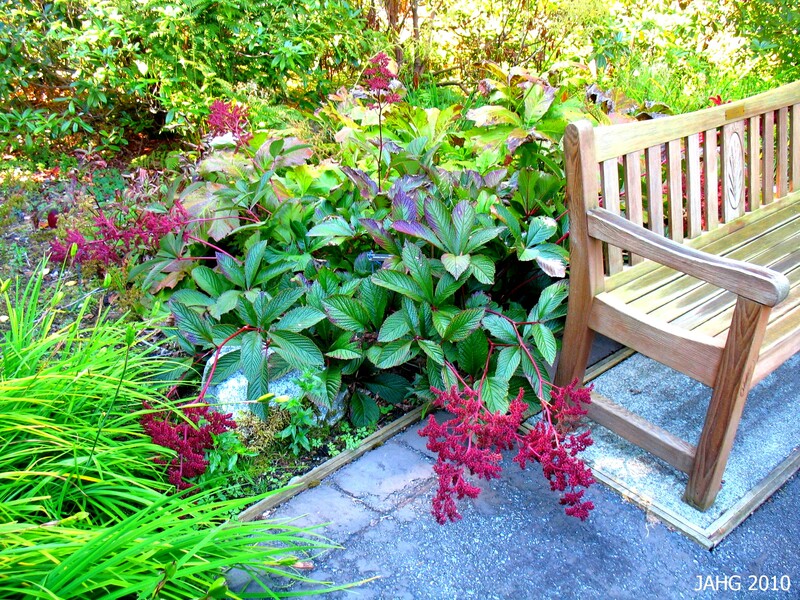 Here Rodgersia sambucifolia has deep maroon and black tints of early autumn at the U.B.C. Botanical Gardens. Rodgersias are remarkable adaptable and hardy given the right care. These plants are normally listed as shade plants but take full sun if they are given adequate water. They are water suckers and this why they are often seen near or along water edges. Full sun will mean better flowers and more vigorous and deeply textured leaves. This remarkable floral display of hybrid Rodgersias is in full sun at Finnerty Gardens in Victoria. Rodgersias have large leaves and spread slowy creating loose clumps of leaves. Most well grown plants will form a clump which is 1.2m(48in) high(including floral scape) by the same wide. 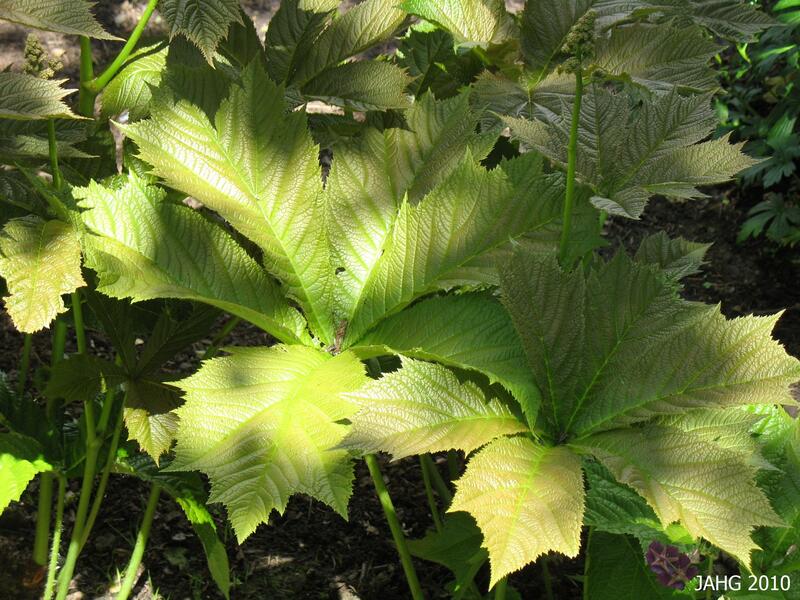 The exception is Rodgersia sambucifolia which only grows about 1m(36in) high and wide. The all apreciate rich humusy soil which retain moisture well during drier times of the year. Site away from drying winds and sites where they might scorch from the sun in more southern sites. 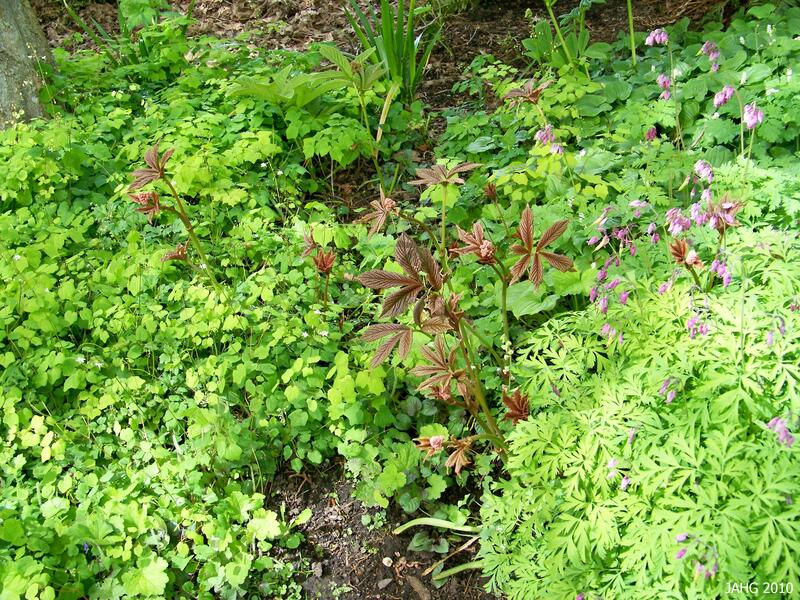 Beautiful Rodgersia pinnata leaves emerging from a bed of Vancouveria hexxandra and Dicentra formosa. Rodgersias are surprising hardy, lately I have been reading about gardeners on the prairies who successfully grow many of the species and they seem to thrive with some extra mulch covering them for the winter. The prairies( Alberta through Manitoba) are definitely cold with winters which haves periods with temperatures below -40c(f) zones 2b through 3b. This all comes as a surprise as they are rated at -20c(-4f) in most publications. Late frost there can damage the leaves and flowers are not so commonly seen, but its really the leaves you really, really want! The floral scapes of Rodgersias are made up of hundreds of tiny, fragrant flowers. Rodgersias can be incorporated into your garden in many ways. Look to put them in a large perennial border or a shrub border, use them for contrasting texture. they look very well in woodland settings as well as shade gardens. The foliage, flower and seed heads add color throughout the year. Fall foliage color can range from blacks, browns, reds and yellows depending on species and growing conditions. Now what should I choose for next week….. I am always looking for great plants to write about and often stumble upon new finds in the most unexpected places. last year while looking for different color forms of Lilacs I came across a plant which was growing through a clump of them which would bloom soon, I decided to come back later and find out what form it was later. I knew it was a rose and it looked familiar, I had seen it somewhere before. 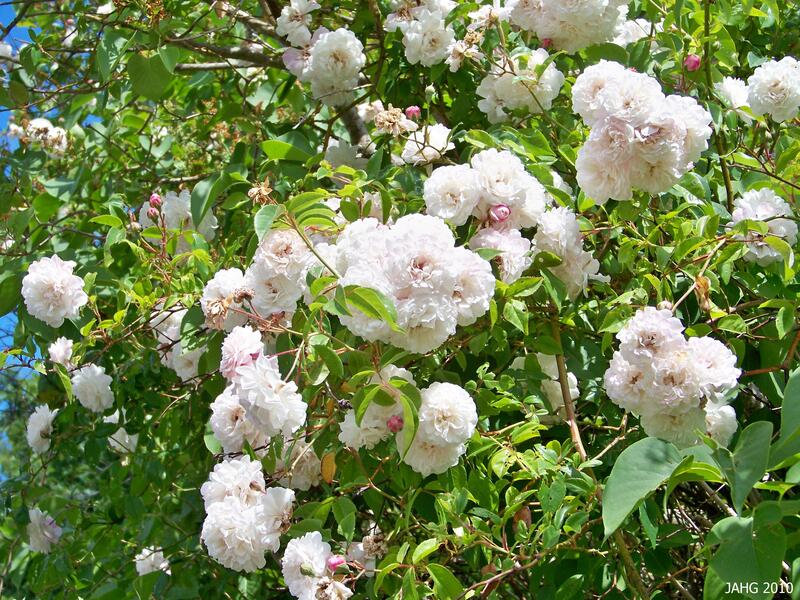 In fact I see it every time I go to St.Ann’s Academy because the rose in question turned out to be a very healthy ‘Felicite Perpetue’ Rose (Rosa ‘Felicite Perpetue’). Rosa 'Felicite Perpetue' is a delicate looking Rambling Rose. Rosa ‘Felicite Perpetue’ is a delicate yet vigorous Rambler which has been known since the early 19th century. Antoine A. Jacques was the head gardener to Louis Phillipe, Duc d’ Orleans for many years and took care of his estates which included Chateau Neuilly. Duc d’ Orleans( later the king of France) loved plants and had a vast collection for A.A. Jacques to work with. At Chateau Neuilly Jacques made some crosses of roses and named at least 3 which have gone on to become famous on their own. Those roses where ‘Adélaïde d’Orléans’ in 1826, Rosa ‘Félicité Perpétue’ in 1827 and the less famous ‘Princesse Louise’ was introduced in 1829. Both ‘Adélaïde d’Orléans’ and the ‘Félicité Perpétue’ Rose both are easily found a rose nurseries, while the other is harder to find here at least. 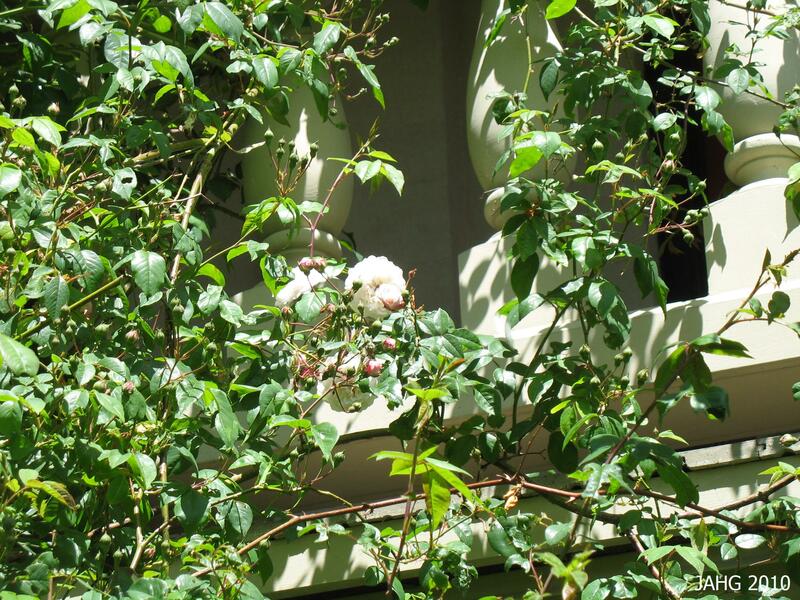 Rosa ‘Félicité Perpétue’ is climbing up the veranda in the Novitiate Garden at St. Ann's Academy in Victoria. There is some controversy to whether the crosses of Rosa ‘Felicite Perpetue’ and her sisters were done on purpose or where accidentally. A.A. Jacques said at the time they were accidental. 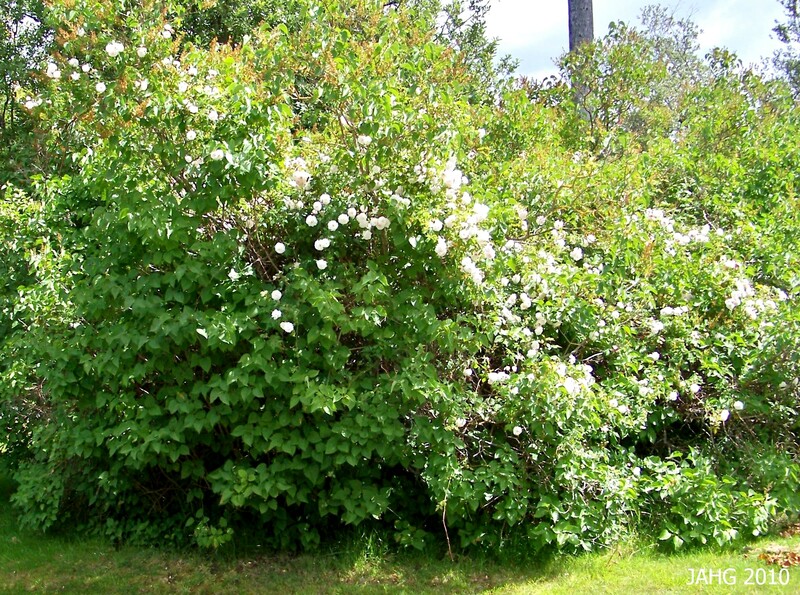 other people believe they were planned as one of the parent plants is believed to be Rosa sempervirens which native to southern Europe but not in the area where ‘Felicite Perpetue’ was found. Rosa sempervirens gave ‘Felicite Perpetue’ was it’s nearly thornless flexible stems and attractive clean foliage which is evergreen in most areas. ‘Felicite Perpetue’ is now the most widely grown semperviren hybrid grown in the world. The foliage of the 'Felicite Perpetue' Rose is always attractive and clean looking. One of the reasons that Rosa ‘Felicite Perpetue’ has been so successful is its tolerance to a wider range of soil conditions than many other Roses. Often these old Roses are found growing on old homesteads or abandoned gardens, such is the case of the one I found growing through a clump of old Lilacs. The Lilacs and Rose were definitely not part of the planned landscape found at the Institute of Ocean Sciences on Pat Bay near Sidney B.C. You will not find it easily as it is not seen from the roadside, instead you have to look carefully in the thickets of Lilacs to find it hanging down from above. Here is Rosa 'Felicite Perpetue' at the Institute of Ocean Sciences peeping through the Lilacs. Rosa ‘Felicite Perpetue’ grows best in fertile, well-drained soil in full sun. It tolerates drought better than many roses and will bloom in more shady places. The leaves do not suffer from the dreaded black spot or mildews here, I have never seen it on any plants. The only thing that is a problem is aphids which are very common here. The stems are flexible and have few spines and have an attractive wine color which is shown of by the flower buds which are pink. This is a vigorous plant which can grow to over 6m(20ft)in height and width in choice growing places. Here it rarely attains more than 4.5m(15ft) and is often seen hanging down from within trees or shrubs. Little pruning is needed other than the occasional shaping, remember when you are pruning that this rose sets its blooms on the previous years growth of lateral stems and you should do any major trimming soon after it blooms so you do not lose the following years flowers. A Rosa ‘Felicite Perpetue’ flower has as many as 40 petals. 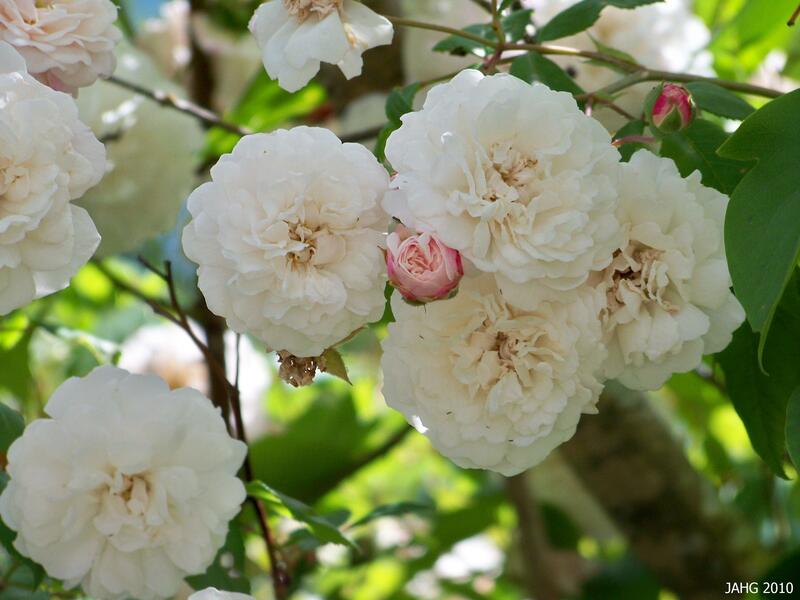 As an old hybrid Rosa ‘Felicite Perpetue’ flowers once a year and produces masses of smaller 3cm(1.5in) diameter blossoms which are produced in clusters. The dense rose-tinted buds contain as many as 40 petals which open a lightly fragrant creamy white, heat and sun exposure does effect color and deepens it. The flower petals do not fall of the flowers therefore deadheading after the blooms have finished is advised. 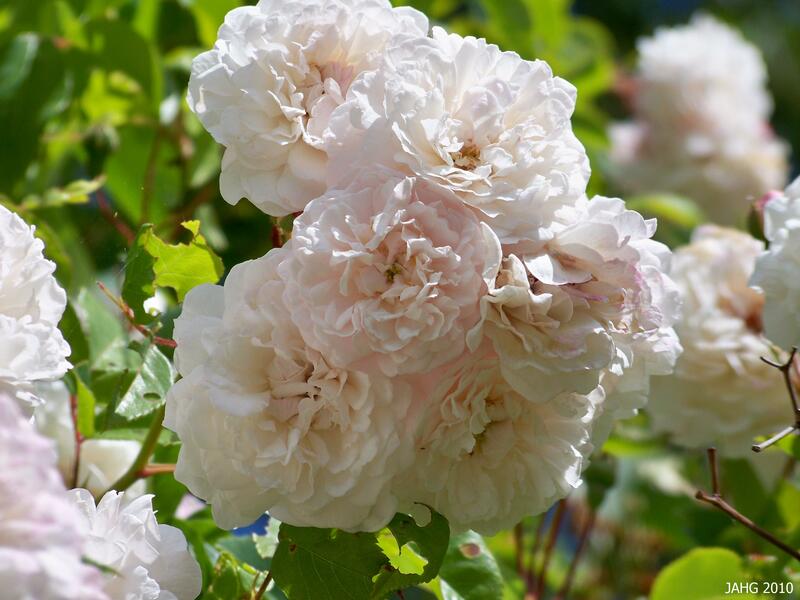 Little pruning is needed other than the occasional shaping, remember when you are pruning that this rose sets its blooms on the previous years growth of lateral stems and you should do any major trimming soon after it blooms so you do not lose the following years flowers. 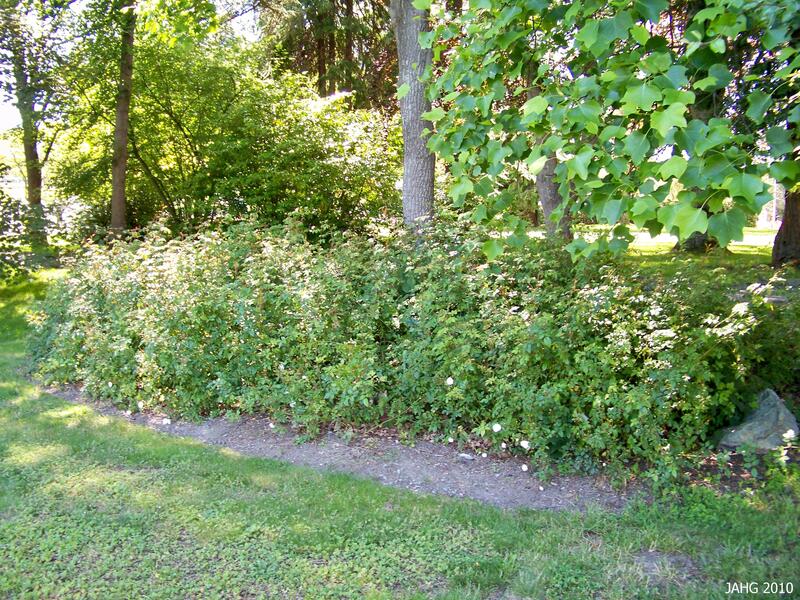 A large patch of Rosa 'Felicite Perpetue' growing in the shade at St. Ann's Academy and blooms every year. Where will we meet next… here I hope! The Master Of All The Gardens. The first time I was introduced to todays plant I really did not appreciate its sublime beauty. It was at I time when I knew to gardening in this mild west coast climate which was like coming to a treasure trove of exotic from the plant desert i had lived in. The plant in question was in the ‘white garden found in Park and Tilford Gardens where I was doing my practicum over the summer months. With experience I have learned big and bright are not always the most easy to work with in designing gardens whereas sublime and subtle are often the key to the best. Astrantias major (Masterwort) are delicate and sublime at the same time while being outstanding garden plants which deserve to be included in many more gardens. Astrantia major, or Masterwort has slight variations in shades of color and flower size. 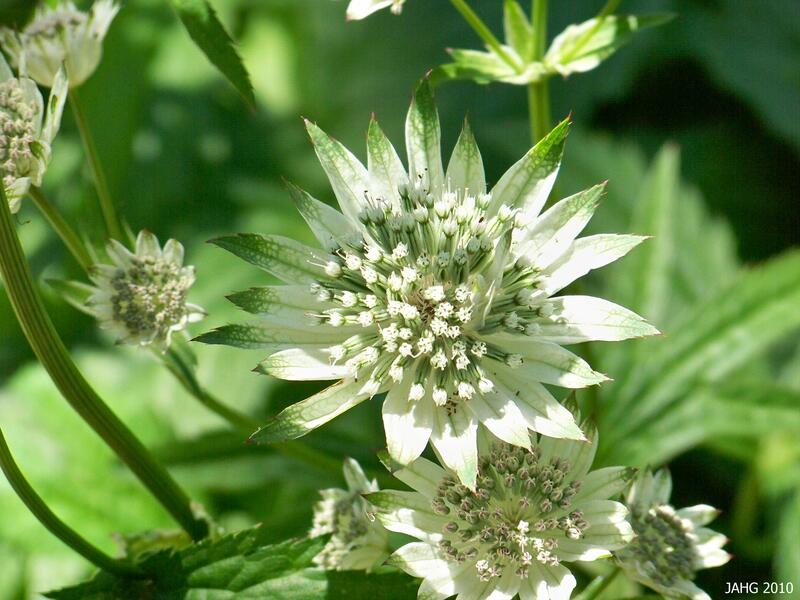 Astrantias have long been known to gardens in Europe where they grow amongst the alpine meadows in the mountains of Austria through the Swiss Alps, and into the Pyrenees of north-west Spain. There at the high elevations and they bloom from July into September. (Great) Masterwort is first noted by English herbalist John Gerard(1545-1611-12?) in 1596 in his famous publication ‘Great Herball, or Generall Historie of Plantes’. In this book he wrote a detailed description of all the herbal plants which he had collected and grew at his garden in Holborn. 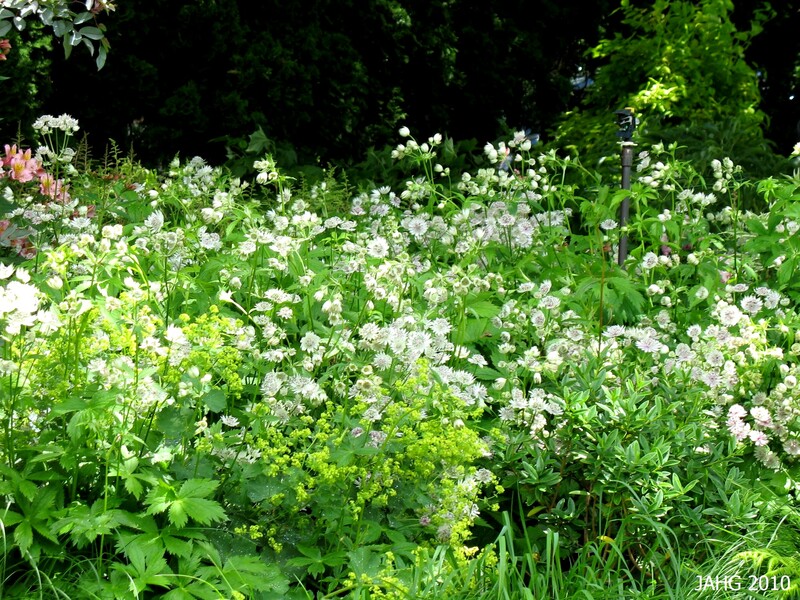 Frothy Astrantia major blooming with Alchemilla mollis make a beautiful floral display in this dappled spot. 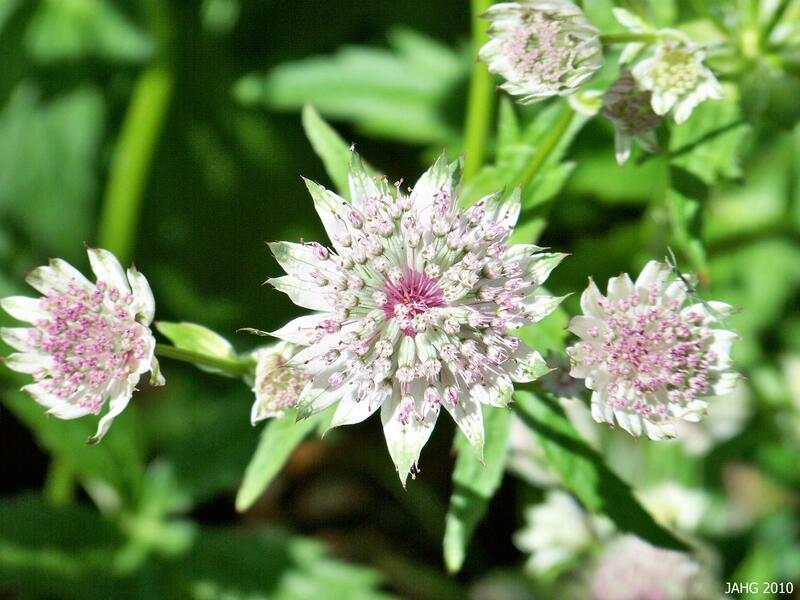 Astrantia are without a doubt are recently being discovered by gardeners here in North America. I was lucky that many years ago to have experience them in the ‘white garden’ as I did not see them again until I came to Vancouver Island and worked as a grower at a nursery here. There I soon found that there were several color forms from dark red through pinks and creams. My favorite Masterwort was one called “Shaggy’ which has a large deeply toothed bracts which are green tipped on cream, it is sometimes sold as ‘Margery Fish’ and should only be propagated by division. The tiny fertile flowers of Astrantia major are found in the middle of the papery green tipped bracts. 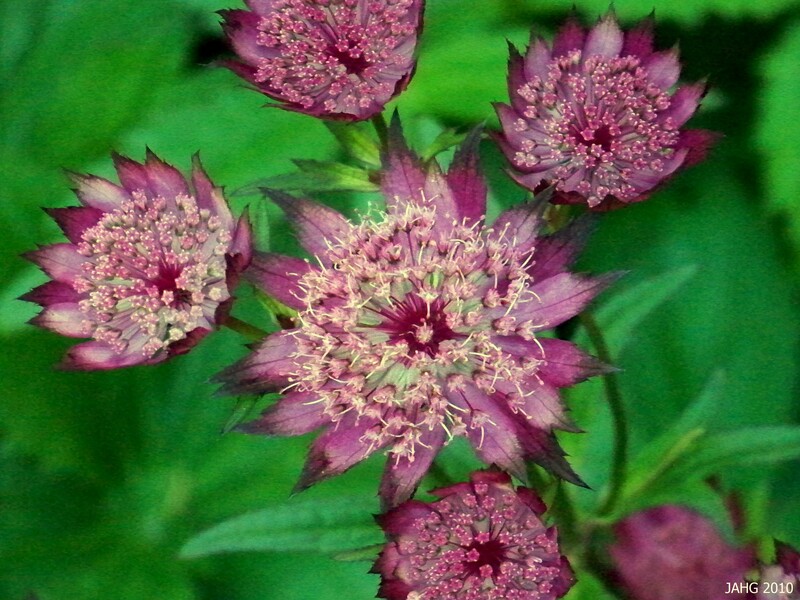 Astrantias are now used in many types of gardens as they are extremely versatile. Margery Fish, the influential English Cottage Gardener recognized their charm, as have many of the well know garden writers and designers of today. You can use Masterwort in full sun or nearly complete shade and still get a respectable showing of flowers. the flowers are extremely long-lasting because they are papery and dry quite well, this guarantee that they make their way into florist shops for their work. The leaves are clean and attractive. One of the many red forms of Astrantia major which are available now. Growing Masterwort is fairly easy as long as you remember a few important things. Astrantias like rich fertile soil which has the ability to retain some moisture during dry periods, these plants sulk if they get too dried out. They will flower best in full sun as long as there is sufficient water available.These are plants which do not like to have their roots disturbed therefore care must be taken when moving or dividing them, they can be slow to bounce back and patience is needed. To get a prolonged and repeat bloom remove spent flowers promptly, this will keep the plant vigorous. Atrantia major will have a second flush of blooms after the first spent flowers are removed. To increase Masterwort you can do it in several ways by division or by growing them from seed. 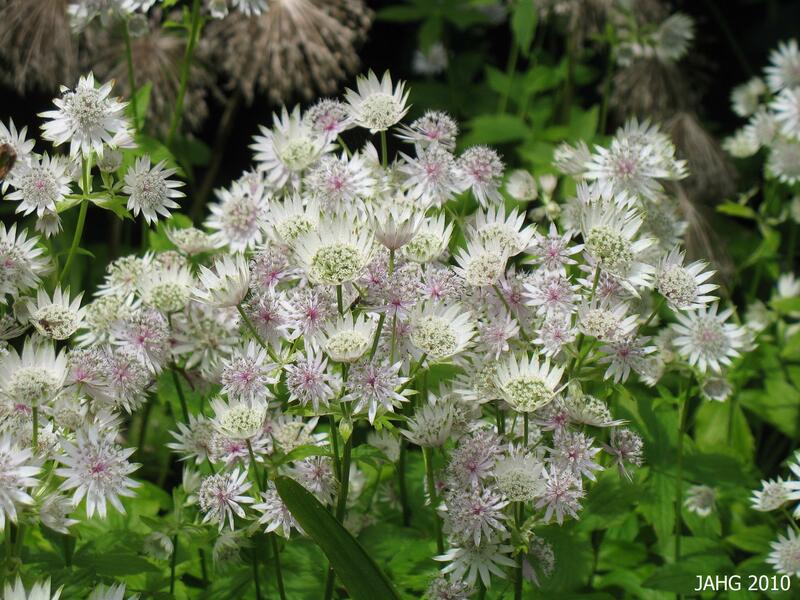 Division is done in the fall or spring when Astrantias are still dormant every 3 to 4 years. Division is the only way to increase your named varieties and keep them true to form and color. Seed may collected and germinates naturally on site if the plants are happy or you can do it yourself. The seed is multi-cycle dormant and I used a refrigerator to artificially speed up the process. Plants from seed will take several years to bloom using this method. Astrantia 'Sunnidale Variegated' has some of the most attractive of all variegated plants. Before putting your Astrantias to bed in the late fall give them a side dressing of mulch and this will help them grow strong roots over the winter. Masterwort are listed as taking -20c(-4f) or zones 5 through 9. These are tidy plant which for slowly spreading clumps of 30-60cm(1-2ft) wide. Hieght of the plants varies from 30-90cm (12-36in) high at the most, most are around 60cm(2ft) tall. New varieties are being introduced, the darkest red so far is ‘Hadspen Blood’, ‘Shaggy is said to have the largest flowers. Another Astrantia you can grow is Astrantia maxima which has pinker flowers with thicker bracts. 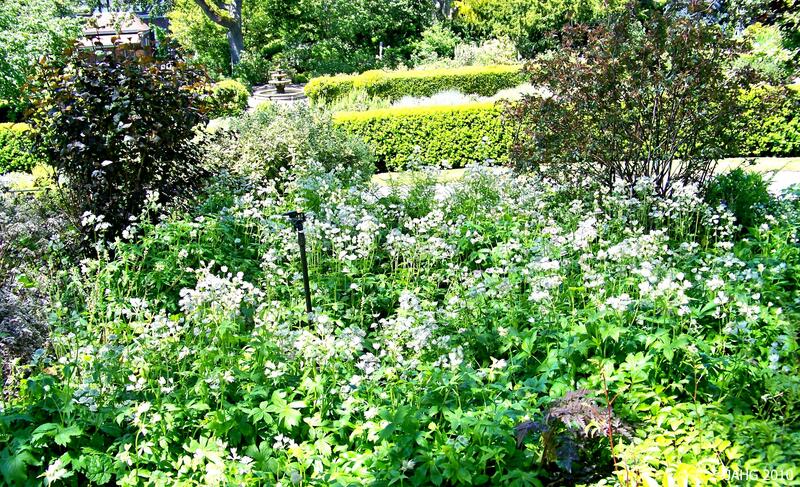 Here in the 'Cutting Garden' at Government House, the Astrantias are used as an informal groundcover. Use Astrantias in your perennial border, shade garden, woodland areas, informal areas, cut flower garden or butterfly and bee garden. 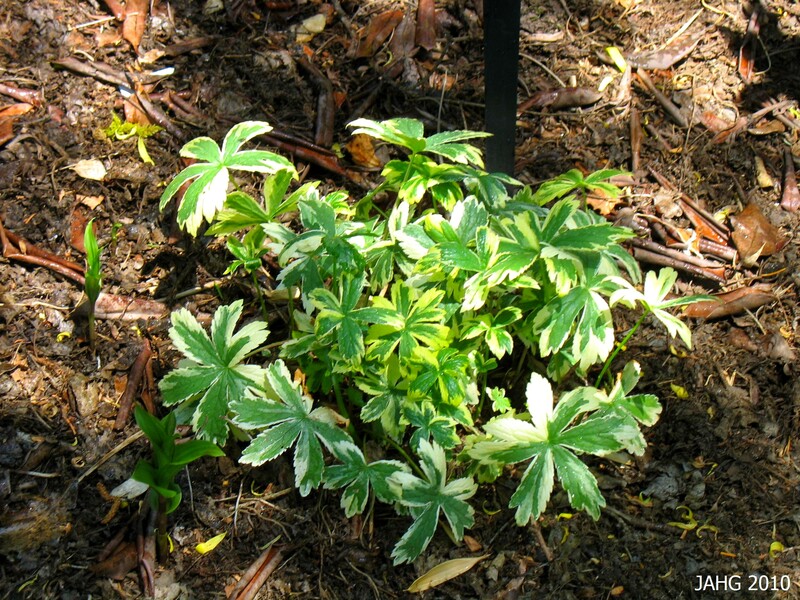 Masterwort mixes well with many plants from Ferns to Rodgersia as well as Hostas, Heuchera, Tellima and Tiarellas and many others. Until we meet again soon on this leafy path….